I thought long and hard about how superhumans would be deployed in a modern society. For many years, I've read books that followed the 'hero' model. Which is fine in a more 'stable' society like the West. But what about the lawless battlefields of the third world? This is where my characters come in, in the space where morality meets the genocidal battlefield. I always liked the idea of dueling heroic philosophies but I needed a way to show the reader as many potential circumstances without bogging down the scene. I wanted a superhuman born a human, a superhuman misused, and a superhuman turned sociopathic by the horrors of war. 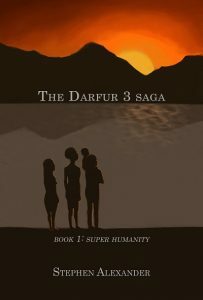 I put my characters through the rigors of the Darfur war, then introduced them to the soft pampered heroes of the West. I like my battles shaken, not stirred. “I’m making my move. Back me up,” ordered Shadow of Vengeance. He jumped down, bending and rolling on the floor like a parkour athlete. Doctor Deceit didn’t hear the landing sound over the noise of his machines, but he did turn as Shadow was standing up and GASP! He saw the hero draw his tonfa batons. “Damn! An annoying hero!” he yelled. “Get down on the ground, or I will put you there, permanently,” ordered Shadow as he took a few steps towards Doctor Deceit. “All I saw were two guys. That’s barely a morning workout for me,” bragged Shadow. Shadow ran towards the group, and swung his batons, hitting their heads and bodies, taking down mindless minions left and right. He spun to avoid a tackle that instead hit the laser bench. “Help me, guys!” Shadow shouted as the minions surrounded him. “No. We’re scared of zombies,” said Jamir, unconvincingly. “Yes, they’re too scary,” said Soad, almost mockingly. “DAMNIT GUYS THIS IS NOT- UGHGH!” shouted Shadow. He was quickly tackled, smothered, and stomped on by thirty minions. Doctor Deceit waved his right hand up as he walked to the unconscious hero, and the minions stopped their brutal assault. Shadow dropped his tonfas as they held him up by his arms, while he kneeled on the ground. The Red Mask team floated down and the minions moved out of their way. After they landed, Soad spoke first.